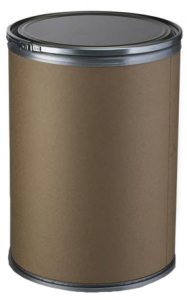 Purchase a drum, and save an additional 20% off the lowest (22 oz.) tub price! This large 60-lb. drum (equals more than 43 smaller containers) of Concrete Rust Remover will safely and easily remove rust on concrete, stone and masonry. Use on basement or garage floors, walkways, driveways, stone or concrete walls, steps, bridges, paver blocks and more. Will not harm grass or vegetation. Can be rinsed off with plain water. Biodegradable. Contains no phosphates. 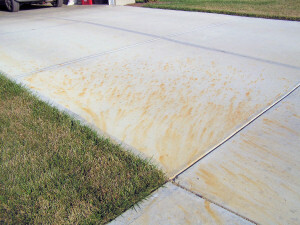 Works well on all rust stains including those caused by lawn fertilizer or untreated sprinkler systems. Great for lawn care services, real estate companies, building maintenance companies, contractors, government agencies, golf courses and more. Product is a powder concentrate that when mixed as directed with water forms a gel that can applied directly to the rust stains. 60-lb. powder concentrate covers approximately 2600 square feet. 2. 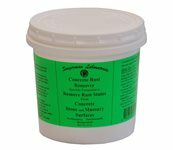 Add Concrete Rust Remover powder concentrate to water as directed on the label. Shipping Weight 65.0 lbs. Ships via UPS. Drums may not be returned. Click here for our 22 oz. 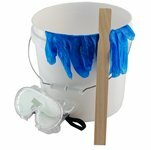 bucket of Concrete Rust Remover. Severe rust stains have formed on the concrete from a rusty pipe. These stains have gone untreated for well over a year. The stains in the treated area are gone. You can still see some light stains remaining on the untreated area. This summer after fertilizing our front yard, my wife and I noticed a tremendous amount of large orange spots on our driveway and sidewalk. It looked terrible and we didn't know what to do. Through the advice of some friends, we determined that we needed a powerful rust removal product to remove the the rust stains caused by our lawn fertilizer and ironite. Luckily, we found The Rust Store's Concrete Rust Removal product. 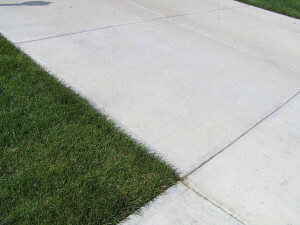 The product was easy to use and with a bit of work, our driveway and sidewalk now look great. What a relief...thank you so much The Rust Store!